An Atlas missile silo can be turned into a spacious home. Originally appeared in Air & Space/Smithsonian magazine. The Peden family has given up seeing sunsets. Ed Peden, an ultralight manufacturer, and Dianna Ricke-Peden, a speech therapist, live on Atlas E missile base No. 6, just southwest of Topeka, Kansas, and their home lies beneath three feet of earth. The section they use as a garage once housed a thermonuclear missile capable of flying 6,000 miles away and producing a four-megaton explosion. Today, there are at least 15 decommissioned Atlas missile sites for sale, ready for transformation. Mark Hannifin of Midland, Texas, bought one that was flooded with 130 feet of water; he uses it for giving scuba diving lessons. About an hour from the Pedens' home, a missile base north of the town of Holton has been converted into a public high school. The entrance tunnel, which once connected the missile's launch area with its control center, has been painted red, white, and blue by the Jackson Heights High School student council. 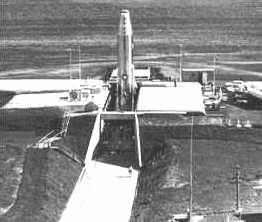 Atlas missiles were America's first intercontinental ballistic weapons; 100 were installed in permanent sites around the country during the 1950s and early '60s, mostly in the Midwest. The Pedens' is one of 21 that went up in Kansas, which was happy to get the accompanying infusion of money. A 1958 story in The Topeka Capital was headlined: "Missile Base Is Viewed With Joy"; another, in a 1961 edition of The Kansas City Star, began: "What is happening in Kansas is almost incredible, and so awesome it shakes you right down to your boots. In a matter of a few months, Kansas will be the nation's No. 1 springboard for long-range missiles." The Atlases were decommissioned only four years later when they were replaced by Titan IIs and Minutemen. In the years following, the Atlas sites were dispersed among local governments, companies, and individuals by the federal government's General Services Administration. Realty specialist John Robinson of the GSA's Ft. Worth, Texas, office says he gets hundreds of calls every year from prospective missile base purchasers (though the GSA no longer has any Atlas sites for sale, it does have sites once occupied by second-generation missiles). "Most want them for secure storage, and paranoid people want bomb shelters," he says. "Others want to grow mushrooms." At least one other Atlas site has been transformed into a home, but that silo owner guards his privacy assiduously. The Pedens, on the other hand, are happy to share their story. Back in the early 1980s, Ed Peden, then a teacher of history and psychology in the Topeka public school system, began to hear talk of Atlas sites in the area. He got his first look at missile base No. 6 in 1982; when he went to inspect it, the underground portions were flooded, and he had to conduct his tour with a canoe and a flashlight. But he saw the possibilities, so he paid a scrap dealer $40,000 for the property. It was a good deal: He got a 33-acre site with a landing strip, plus 15,000 square feet of available underground space. The ceilings were so high he was able to put in an upper level that added 3,000 square feet. Ed had long been interested in underground housing because, according to his advocates, it requires less energy to heat and cool. And he was able to use part of the launch area for assembling the ultralight aircraft he sells. Today, two years after they finally moved in, the home portion looks fairly conventional, though a few structural inconveniences remain. 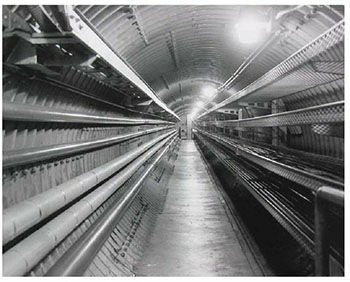 It takes the Pedens several minutes to answer the doorbell, for example, as they have to walk the length of a 120-foot tunnel. The tunnel makes an eerie foyer. When the double steel doors at the end are slammed, they send dungeon-like echoes off the walls, as if you are entering another world or a really big basement. At the other end, a wooden door opens onto the former control center, now the Pedens' home. At 2,800 square feet, it's about the size of a typical suburban rambler. The inside seems unremarkable, except that the rooms have 15-foot ceilings and at the entrance to the living quarters is an old panel with switches for initiating a launch. Though the living space is comfortable enough, once in a while the Pedens' two daughters, Ashley and Heather, mutiny. "Dad, why do we have to live in a hole in the ground?" they ask. The Pedens do plan to build living space above ground eventually. Peden teamed up with former student Tim Schwartz to form the Twentieth Century Castle Company, essentially a real estate agency for old Atlas bases. As of August, they had sold six, gotten a sale contract on a seventh, and obtained listings for 15 more. Recently, Ed Peden drove a visitor to a site that he's sold to a spring manufacturer. Located in the Kansas town of Wamego, the site, says Peden, was the nation's best preserved "E"-type (of the three Atlas variants made, the "D" and "E" were stored horizontally, to be raised by crane in the event of a launch, and the "F" was stored vertically). Inside the control room, lime green paint created a gloomy, haunted feel, almost as if you were in the heads of servicemen ready to start the launch sequence. Morbid souvenir hunters had removed launch buttons from the control desk. Many of the sites give off an aura of doom, and, like the aura that surrounds graveyards, it inevitably attracts kids. In New Mexico there are "silo clubs" — more accurately, gatherings of young people drinking beer. And stories circulate about dead bodies and ghosts and a silo-dwelling hydra-headed monster — stories that occasionally inspire dangerous stunts. Cass Mason, director of the Department of Public Safety in Hagerman, New Mexico, has been on two rescue missions in the last few years — once when a man fell 40 feet into an Atlas-F, and another when children who were burning old Air Force manuals suffered smoke inhalation. "All the sites have their problems," he says. Dave and Rose Sigler of Roswell, New Mexico, ran into big ones after they bought an Atlas site in 1991 with the idea of converting the underground control room into a home. Before they could move in, they discovered the site was contaminated with various chemicals — possibly rocket fuel, gasoline, industrial cleaning agents, and other compounds that had been dumped there three decades ago. The Army Corps of Engineers, which is responsible for detecting contamination of former missile sites, has been a continuing presence on the property for fives years now. "I can't go out and put in my kid's playground because they are out there taking core samples," Dave Sigler says. Regardless of the dangers, the Pedens' faith in the value of the old missile bases is unwavering. Ed Peden believes that the sites will last until or beyond the next ice age, so the Pedens view themselves as stewards, not owners. "It's part of what we believe," Dianna Ricke-Peden says. "We don’t believe in holding on to things." But they also believe that to feel comfortable in their new home, they needed to hire a medicine woman to perform Lakota Sioux rituals she said would cleanse the negativity left by years of concentrated nuclear thoughts. "She turned the energy of the destructive warrior into the protecting warrior," Dianna Ricke-Peden says. "It was a beautiful experience." The Pedens tend to talk about warfare in terms of psychological forces; Ed once wrote a poem about his Atlas base titled "Transformation of Sight," one line which reads: "The ultimate male ego's warped will." "It's remarkably phallic," he explains; "the missile raises up erect, then penetrates the atmosphere and spews radioactive waste to countries thousands of miles away." The poem ends with a statement that sums up the spirit in which the Pedens approach the transformation of missile silos: "Ancient fears will transform into Love." In transforming a missile silo into a home, the Pedens have incorporated many of the domestic comforts family happiness has traditionally thrived on. They admit, though, that a lack of sunlight sometimes leads to depression. "We try to plan time outside every day," Ed Peden says. When they do leave, they put on the answering machine so that callers can hear their message: "We must be on the surface just now," it says. "We will inevitably return to our burrow."